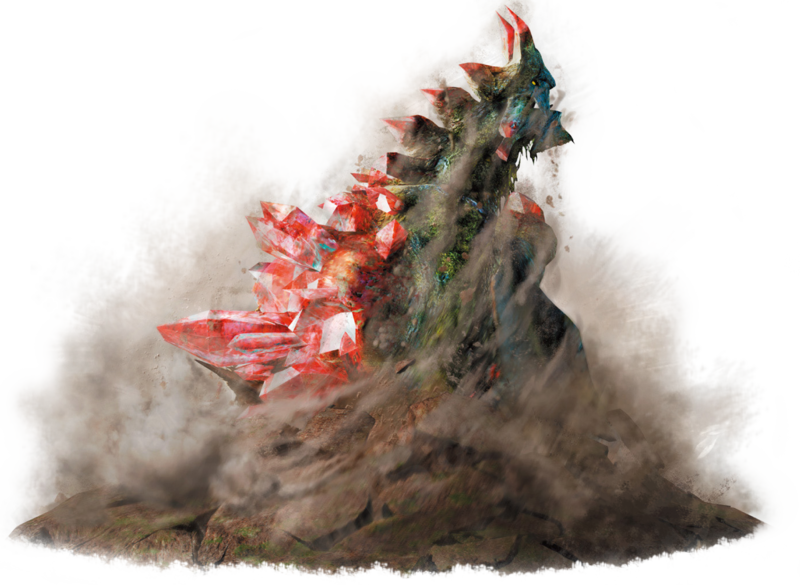 This week’s Beasts of Monster Hunter 4 Ultimate focuses on the Ruby Basarios, a subspecies new to the fourth generation! 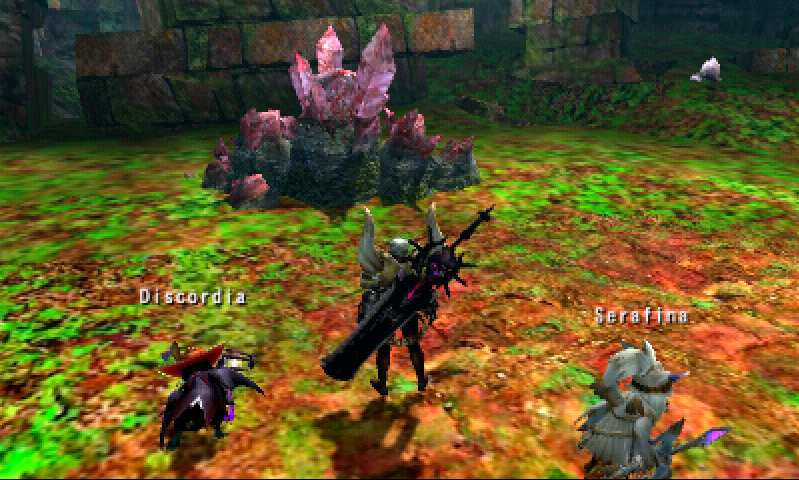 The Ruby Basarios is new to Monster Hunter 4. It has a tendency to try to blend in with the other rocks in the area it spawns in, but is generally a slightly different colour from the regular ones, allowing it to be distinguished from the rest. The Ruby Basarios is similar to the regular Basarios, but has pink rocks running along its back and on its wings. It has a rocky outer shell covering its entire body, guarding the flesh underneath. It can only be fought in the Unknown Forest, 4 Ultimate’s freehunt area. The Ruby Basarios the juvenile form of the Ruby Gravios, and – Wait, no, that doesn’t exist. The regular Basarios is the juvenile form of the regular Gravios, but that is not the case for the Ruby Basarios, so I’ve no idea what it grows into. It’s classed as a flying wyvern, but can’t actually fly. The closest it comes is when it flutters into the air and slams back down to the ground in a powerful attack. This attack will fail if its legs are broken, causing it to roll over and be opened up to attacks. Aside from its legs, the Ruby Basarios’ head and back can be broken, and its stomach can be broken twice. 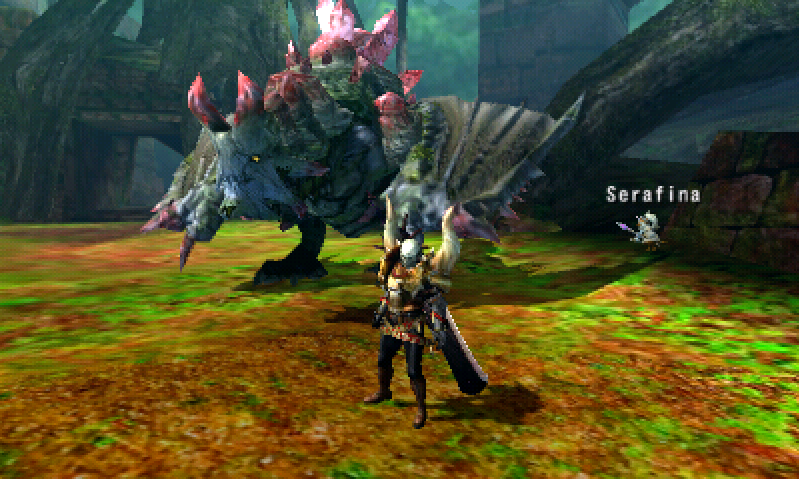 If you try to ride a Ruby Basarios after breaking its back, it will roll over and expose its stomach instead. The Ruby Basarios, like the regular Basarios, has an attack in which it will charge the hunter. It can also secrete poisonous fumes from its body, sometimes even spitting out fiery gases or sleep powder. It’s weakest to the ice element, so bring a weapon that can exploit this. The Ruby Basarios can also shoot a fiery laser beam across the map, which does quite a bit of damage after it connects. 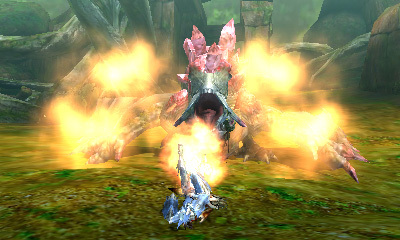 Sometimes after firing this beam, it will let out some of its fiery gases, almost as if to cool off after the attack. The Ruby Basarios fight, you may have noticed, is very similar to the regular Basarios fight. 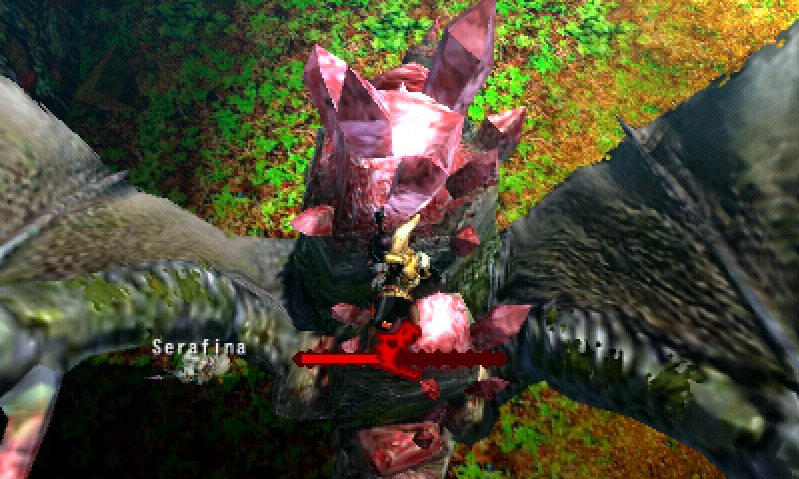 The only real difference is that the pink rocks on this monster’s back can be scattered across the map and explode after a short time, and can harm the hunter. They can be mined before they shatter. The Ruby Basarios’ back can also be mined after it’s been broken. That’s all for the Ruby Basarios! Next week I’ll be covering one of the two new Tigrex subspecies, the black Brute Tigrex!